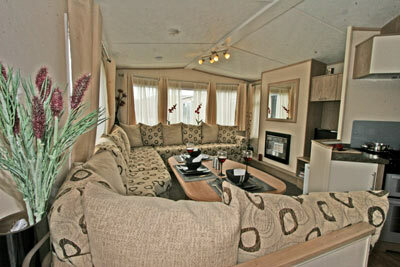 Victory Leisure Homes introduced the Ventura single unit caravan holiday home in July. This entry level model is the first from the newly formed company which displayed its 2010 range at Cottingham Golf Club show earlier this month. This show takes place just a stone’s throw away from the Lawns Show and runs at the same time. We were impressed as soon as we entered the Ventura via its nearside elevation single door into a bright open-plan living/dining and kitchen area; the very practical vinyl floor covering extended from the entrance into the kitchen and then we noticed the super range of glossy finish eye-level and base cupboards in the kitchen. 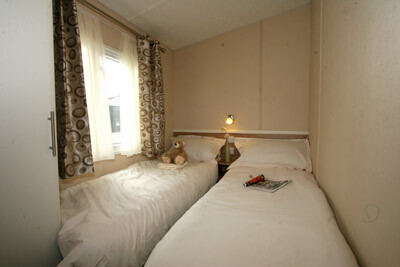 There’s a radiator and space for a fridge, a gas fuelled cooker with oven and separate grill. An extractor fan is an optional extra. We liked the position of the window over the single sink and drainer. There’s a huge ‘L’ shaped sofa which will be a telly addict’s dream and we liked the fact that all the upholstery is reflex foam so it recovers its shape quickly. The black and stainless steel gas fire is the focal point of the room and has a large mirror above it. We liked the cupboard above the TV shelf and the open shelves under it and we thought that five people could sit quite easily at the space saving, free standing dining table. The good size shower room has Jack and Jill doors and we liked the design of the shower which has a sliding door, some shelves for the essentials and a little seat. 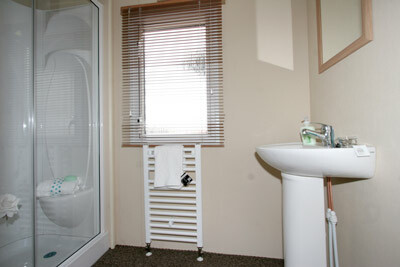 The heated towel rail runs off the ‘C’ grade central heating boiler, and the basin has a mirror above it. The toilet is in a separate room further down the hall. The master bedroom has generously sized wardrobes which we liked; the 4ft 6ins bed has two shelves each side of it, just right for the night time cocoa and morning tea. The dressing table is neat and has a comfortable stool with it. 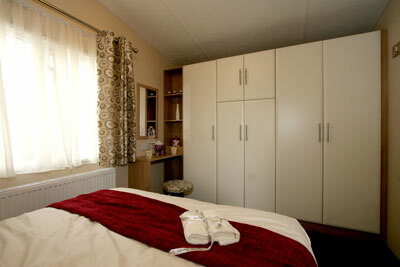 The second bedroom has twin beds with a fixed shelf between them, a shelf with a mirror above it and a single door wardrobe. The model we saw was a pre-production prototype so there may be small changes to future models, but as an entry level product we think it’s good value for money. 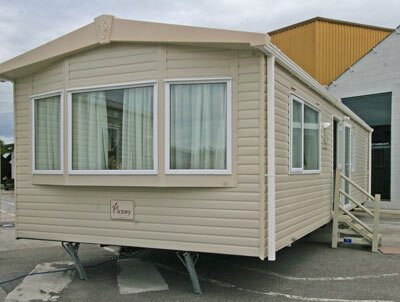 The caravan holiday home is built to EN 1647 (leisure use standard) therefore is not intended for extended winter use or residential use. 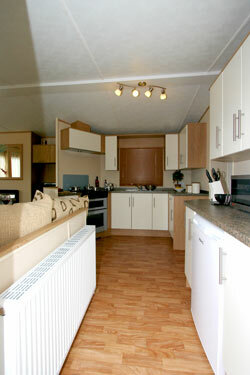 Great to see a new holiday home manufacturer doing so well!